Auto NYC Diesel from Advanced Seeds stands for New York City Diesel, a very famous strain that is originated by crossing a Mexican Sativa x an Afghan Indica. This Auto NYC Diesel is Indica dominant. 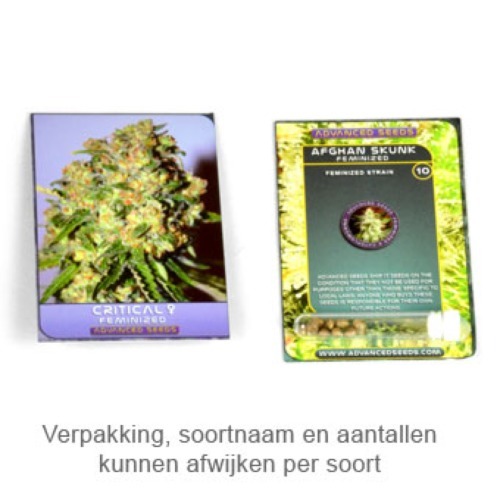 These feminised cannabis seeds are from good and stable quality. Advanced Seeds Auto NYC Diesel can reach a reasonable height because of the content of Sativa. She has quite a lot of branches and is appropriate for an indoor grow and outdoor grow. Growing cannabis from these feminised cannabis seeds is not difficult but this plant does need some care. When you grow this plant indoor, it is advisable to use a carbon filter because she can smell during her flowering time. This weed tastes strong, slightly like lemon and orange with a light spicy flavor. Tell us and our customers what you think of the Auto NYC Diesel from Advanced Seeds.